In 1891, George A. Hormel started a company built on pride, hard work, innovation and the belief in the quintessentially American notion that success is within reach. So, it is little wonder that Hormel Foods has held fast to a commitment of service to the country whose freedoms and opportunities made its success possible. Throughout the company’s history—and in the face of several wars—Hormel Foods has supported the United States armed forces. We continue to honor this commitment with both pride and a sense of great privilege. During the 10-week Spanish-American war of 1898—a mere seven years since the company’s founding—George Hormel gave $10 as a show of support and promised full benefits and jobs upon return to three employees who enlisted with Company G of the Minnesota National Guard. The absence of even three employees was significant, given the size of the company at that time. 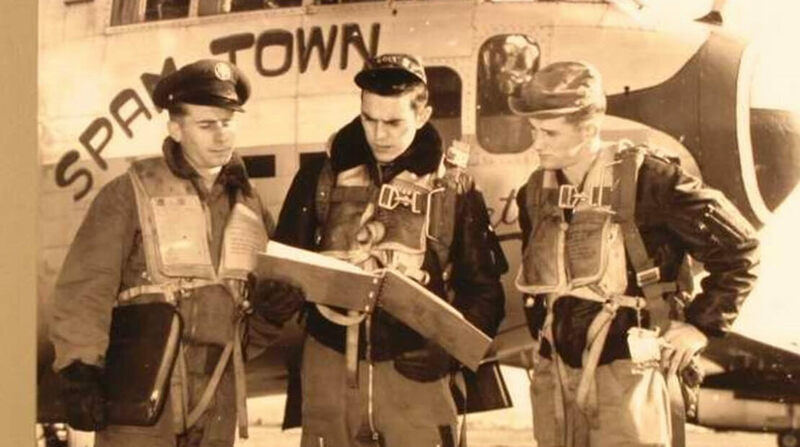 Among the three enlistees was Ben Hormel, George’s brother. His enlistment is in itself a testament to the patriotism that was so deeply a part of the Hormel family’s values. In 1917, the company joined the effort as World War I erupted in Europe. George Hormel was called to Washington, D.C., to hear the wartime measures instigated by Herbert Hoover, head of the U.S. Food Administration, to regulate meatpacking operations in order to conserve and increase the supply of meat, stabilize prices and keep packers from selling on the black market. Jay C. Hormel, George’s son, was the first enlisted man from Minnesota to report for service at Camp Dodge, Iowa. He was a member of the 351st Infantry, 88th Division, even though he could have deferred due to his role in the important food industry. He was promoted to chief quartermaster at Tours, France, in 1918. Even after leaving the Army, Jay continued to support the military by assisting the government in ongoing food-related programs and policies. He became the second president of Hormel Foods in 1929. At no time in its history has Hormel Foods been more involved in—and committed to—its country’s war efforts than during the World War II. With the passing of the Lend Lease Act of 1941, the United States agreed to provide as much “aid short of war” as possible to our Allies who were already enmeshed in the conflict. For Hormel Foods, this meant shipping up to 15 million cans of meat per week overseas, most of which was the iconic SPAM® brand. By 1944, more than 90 percent of the company’s canned foods were shipped for government use. By early 1945, 65 percent of all Hormel Foods products were consumed by U.S. troops in the European and Pacific theaters. 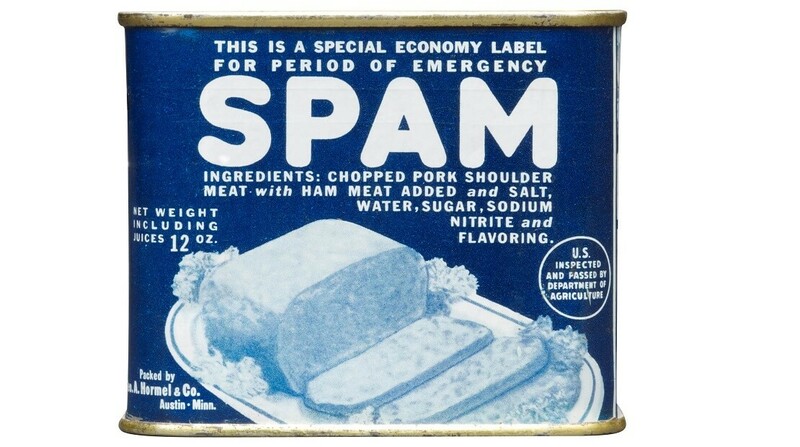 The equivalent of over 133 million cans of SPAM® products fed hungry soldiers and civilians overseas between 1940 and 1945. One of the biggest efforts by Hormel Foods in support of the war was the Liberty Bond (called war bonds after the bombing of Pearl Harbor) purchasing program, whereby employees could buy bonds with funds taken directly from their paychecks. By 1942, a full 90 percent of employees were buying bonds this way. Hormel Foods also gave employees who were called to serve a great measure of assurance when Jay Hormel announced that returning military would retain their old jobs without any loss of seniority. He informed military members of this good news in a personal letter. In fact, writing letters to his employees in the service was something that Jay did faithfully and regularly. Altogether nearly 2,000 Hormel Foods employees were called to active duty, 65 of whom gave their lives. 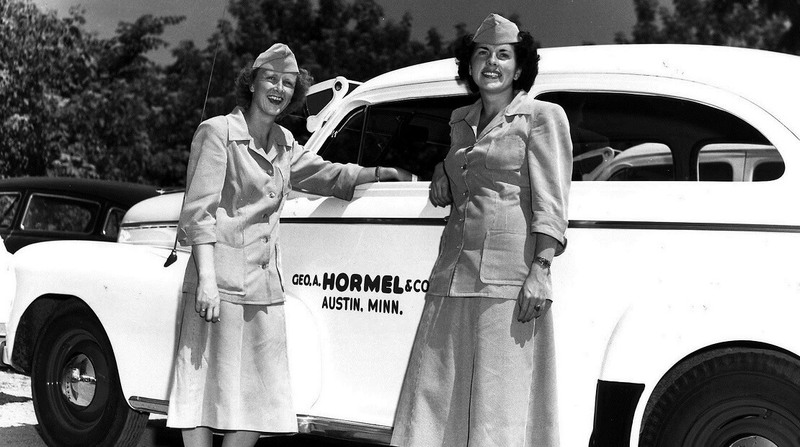 While male employees were away serving, Hormel Foods hired 1,300 women replacements to ensure that the company was able to keep up with production. Even after the war, Jay Hormel’s patriotism and commitment were evident, as he remained active in the American Legion for many years. 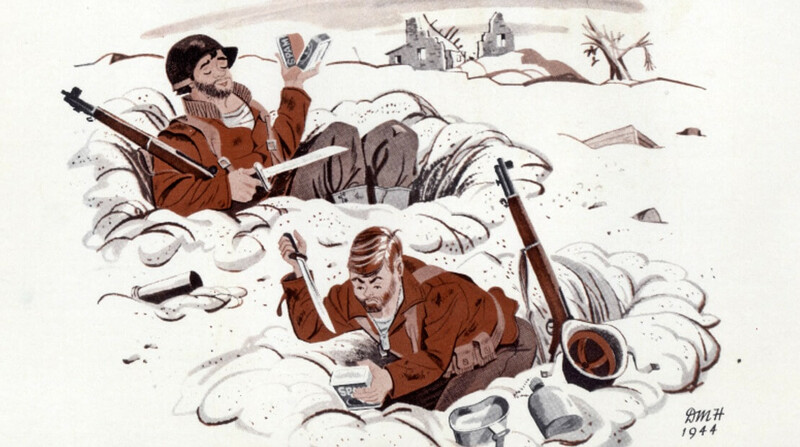 1942 saw the introduction of the first military K-ration, the much maligned but lifesaving battlefield meal. Hormel Foods provided the ingredients for these rations, which included pork with apple flakes and carrots; veal loaf; chopped pork and egg yolks; and ham and eggs. A letter from Dwight D. Eisenhower to Hormel Foods, to mark the company’s 75th anniversary, comments on the company’s products that were eaten daily by American GIs. Hormel Foods continued its tradition of supporting the military during the Korean, Vietnam and Persian Gulf wars. Once again, military leave was granted freely to the hundreds of employees called to duty, with the promise of jobs waiting upon their return. Hormel Foods honored military service during the Korean War as well. Once again, military leave was granted freely to the hundreds of employees called to duty, with the promise of jobs waiting upon their return. During the Vietnam War, the company again supplied food for the Armed Forces, facing and overcoming the challenges of meeting supply for huge orders from the U.S. quartermaster. 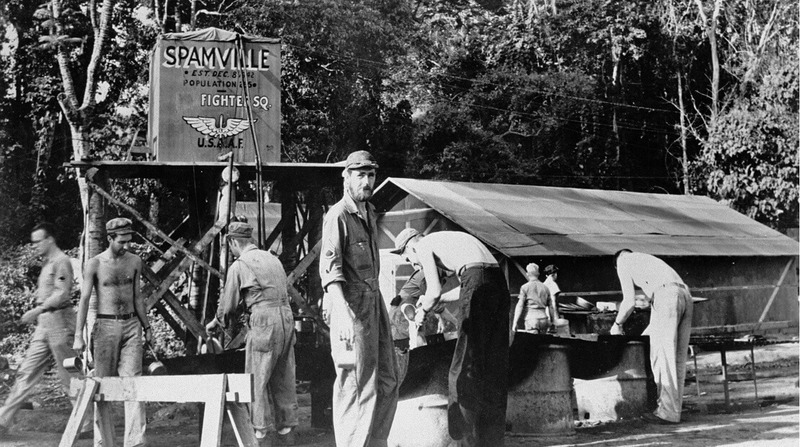 SPAM® products nourished Americans in Korea and Vietnam alike, providing much-needed protein to soldiers far from home. Supplying nutritious sustenance for American troops continued through the Persian Gulf War and our country’s most recent conflicts in the Middle East. TOP SHELF™ packaged dinners—the same meals sold to consumers in grocery stores—became a most welcome change from the ubiquitous MREs. Our support is constant, in war and peace. The company also supplemented the military salaries of any employee serving, helping soldiers’ families get through the difficult time apart. Making food is what we’ve been doing for more than 125 years, always in step with the needs and trends of the times. That includes our customers in the United States military, whose needs are so important in terms of nutrition and taste. Today, we supply the military with exciting foods that offer our military men and women a taste of home, providing a measure of comfort and familiarity when they’re far away. Nutritious products like our Natural Choice® line of meats, authentic global flavors like Café H® meats and comfort foods like Austin Blues® barbeque deliver that much-needed variety and enjoyment. Hormel Foods will continue its support of the U.S. military for as long as it takes. It’s a history and a partnership that make us proud.